Integrating Lime's LMS7002M RF device, the solution provides flexibility and performance for communications systems designers, without consuming high amounts of power. The devices can easily be programmed to produce any combination of waveform and RF transmission, making them suited for MIMO wireless applications, as well as other RF techniques useful for military communications. 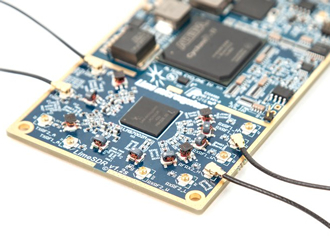 "By combining an Altera FPGA for digital processing with a Lime FP-RF transceiver, we can offer a new level of wireless performance and the ultimate solution for SDR applications. Altera’s FPGAs paired with Lime’s FP-RF transceivers enable designers to create low-cost, fully programmable wireless systems across multiple applications such as remote radio heads, base stations, military comms, SDR, and IoT applications," added Ebrahim Bushehri, CEO, Lime Microsystems.